Gamefly has opened Gamefly Digital, its new online storefront, and is celebrating by slashing prices on its library of 2K Games titles. Do you like cheap games? Of course you do! Who doesn't when you really get down to it? As far as we've heard there's no sect of gamers that gets its personal jollies from laying down their hard earned cash on a game that's full price. That in mind, if there are any titles from 2K's publishing library that you've had your eyes on, you might want to swing over to Gamefly's fancy new digital storefront where the publisher's products, including Bioshock: Infinite, Borderlands 2, and XCOM: Enemy Unknown, are currently riding a wave of heavy discounts. Where previously Gamefly had based its business on game rental accounts, the new storefront represents the results of the company's desire to expand its horizons and join the digital sales game. The 2K sale (up to 80 percent off), in turn, was put in place to celebrate Gamefly Digital's launch. 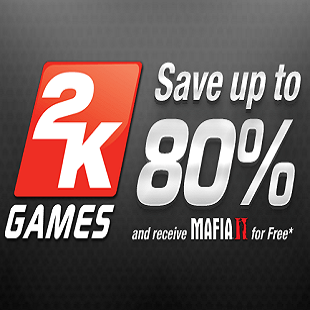 In addition to the price drops, players who buy a full-sized 2K game will receive Mafia II as a complimentary gift as thanks for their patronage. While the internet is already pretty well filled to the brim with digital game stores, it never hurts to have another. There's no way to tell, of course, if Gamefly Digital will be a success, but now that its doors are open there's no point in overlooking the fruits of Gamefly's labor. If there's a 2K Game you've been wanting, this may be your chance to get it.